When I moved to China eight years ago, I was quite shocked at seeing milk in small boxes piled high on store shelves — at room temperature! With expiration dates longer than six months! How could this be safe — and nutritious? Like most other Americans, our milk was bought and sold at refrigerator temperatures, and kept fresh only for a week or so. One of the greatest public health advances in the modern world is pasteurization. 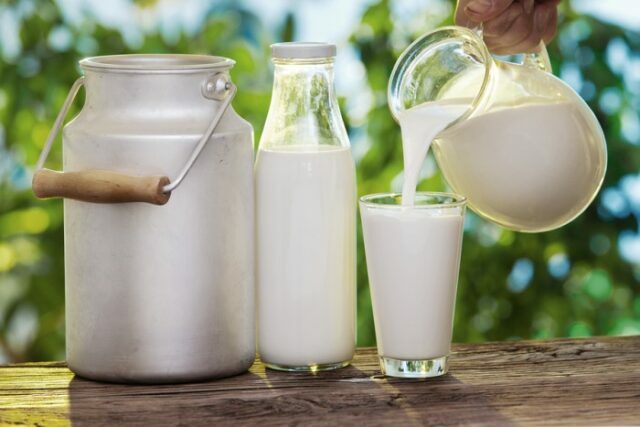 All milk must be sterilized after being delivered from the cow (or sheep or goat), mostly to kill dangerous bacteria and spores that otherwise can seriously harm and even kill people. To kill the pathogens, milk is exposed to high heat at specific lengths of time — this is called pasteurization, named after the famous 19th century French scientist Louis Pasteur. Heating not only kills pathogens but also slows down spoilage, which is triggered by other sets of bacteria. Pasteur’s heating technique doesn’t kill all bacteria, which is why it must be kept cool and used within a couple of days after opening. Normal pasteurization heats milk to around 70 – 75 °C for 15 seconds, — but the newer technique heats at up to 150 °C for 5 seconds. This is why it is called ultra-high temperature (“UHT”) milk, which is what you see written on these cartons. At such a temperature, all harmful pathogens, including spores, are killed, as well as the enzymes which could spoil the milk, which is why you can keep at room temperature for months. The milk also goes directly into the container after heating, which eliminates possible contamination. Most Europeans will find my initial hesitancy of UHT milk quite amusing, as it’s become the popular choice in most EU countries for many years. In China, almost all milk in stores is still the traditional pasteurized milk sold from the chilled containers, with UHT mostly still only available as imported brands in expat and upscale supermarkets. Fortunately, this UHT milk is now easily available on all major shopping websites for home delivery anywhere in China. I have many patients and online readers, both expat and local Chinese, who are desperate to find quality milk sources ever since the melamine scandal of 2008 — especially for their children. 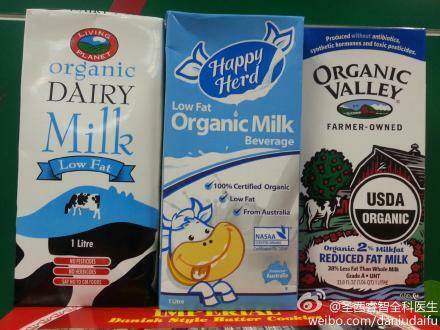 My response to all is that UHT milk is a great choice — especially imported, and why not get organic as well! Such milk certainly is a far better choice for toddlers than toddler formula, which has no medical indication from any pediatric groups anywhere for its preference over milk. I drink imported organic UHT milk mostly as a food safety precaution, but I also feel very reassured that my toddler son and family are all drinking milk 100% free of pesticides, heavy metals and growth hormones, from cows fed on grass in healthy organic farms. Given all the constant uncertainly here with food safety scandals, why not have some peace of mind with your milk? Besides humans, what other adult mammals drink milk? Is it possible that the issue is not pasteurized versus UHT milk, and instead whether human adults should be drinking milk in the first place? Thanks for the comments. Certainly milk is most important for babies and children, and later in life is a much smaller part of a balanced diet for humans. Plenty of other foods have calcium and fats and other nutrients from milk. But my article isn’t really discussing milk for adults, it’s talking about proper nutrition for babies and kids. You are right, and if there is merit to the observation that no adult mammals drink milk, it might also be true that no mammal children drink milk past the stage of being weaned from their mother’s milk. To be honest, I’m not 100% certain of the answer to this issue, it is just interesting to me that it is seldom discussed that maybe milk isn’t the miracle health food that most people assume it is. There is probably compelling evidence that children that drink milk grow up to be healthier than those that don’t. Do these studies factor in that children that drink milk also most likely consume more calories and come from wealthier environments? Are there any studies that show children consuming equivalent calories and coming from equally wealthy environments that milk has any positive impact on their development? Dogs and cats drink milk. Probably other mammals would do it happily, too. It’s not a matter of biology so much as access. They wouldn’t go up to a cow searching for a teat, but will happily lap up cow’s milk if it is made available to them. I have heard ‘rumors’ from other ex-pats of both fresh and UHT local milk being injected with hormones that can negatively affect kids – do you have any thoughts on this? I’m not aware of any specific mentions of local milks with that, but certainly overuse of hormones in much of the animal products in China concerns me. Along with the overuse of antibiotics and pesticides, plus all the heavy metal runoff on farm land — there are quite a few reasons why I’ve minimized my exposure to anything grown in China, as much as I can. I find the comment that because other adult mammals do not drink milk, it must be that we should not drink milk to be absurd. How many adult mammals take penicillin? How many adult mammals read books? How many adult mammals divide in to countries? Banks? Go to space? Submerge under water? Practice Science? Art? Comment on Social media pages? Oy! This train of logic lacks common sense. Is it UHT milk need to boil before drink? How many days it is safe after open the Bottle cap? For me, its the fact that virtually all milk is homoginised that I don’t like. I keep milk to a minimum (Lactose, Casein, Apsaragine and bad karma – a dairy cows life is worse that many factory animals).